It's a shock when you go to the supermarket shelf you have gone to for years – decades in my case – stick your arm out and find yourself holding two bars of Sélection Maple Walnuts rather than the expected two bars of Suprême Noir Authentique (78%). Your usual stuff is nowhere to be seen on the shelves. No point asking the shelf stackers: they never have any idea about anything. Off to the website. Can it be true that the shop has discontinued stocking this chocolate? No, thank goodness, it is still available, just not for some mysterious reason at my local branch. Scroll down a bit. 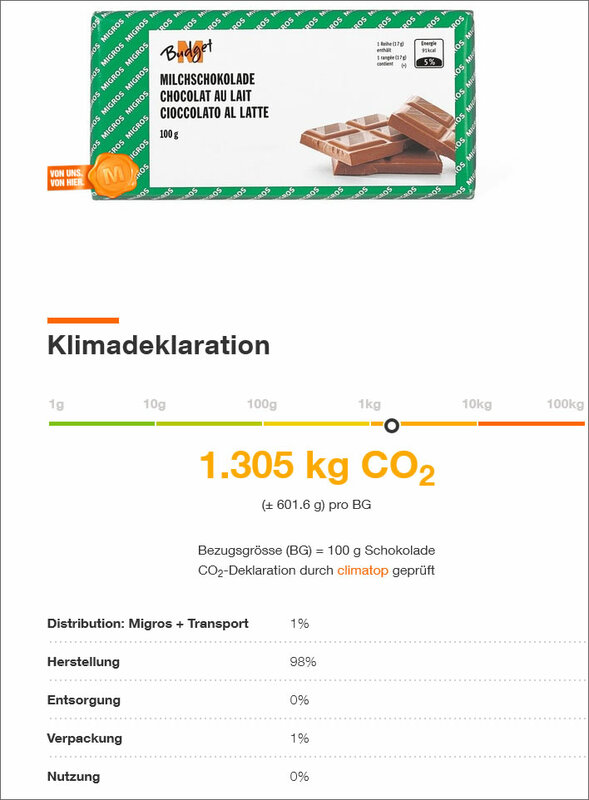 I am surprised to find that the website makes a 'climate declaration' for this product, according to which, each bar of Suprême Noir Authentique I have scoffed over the years (a shamingly large total) has emitted 2.842 kg of carbon dioxide (about 1.5 cubic metres for the curious who are still awake). As a result of my addiction a large part of central Europe is now boiling under a belljar of this dangerous gas. It is a rule on this blog that nothing is as it seems on the surface. The worrying fact that the stated percentage values do not add up to 100 and that the item can apparently be distributed and transported with zero emissions of carbon dioxide we shall leave unexamined. But in particular we also treat all real-world quantities given to an accuracy of three decimal places with great suspicion. Ah! there you are, some small print is underneath: (± 1.602 kg) per bar. So this number, 2.842 kg, given here to an accuracy of a single gram, might really be 4.444 kg. Or then again, it might really be 1.240 kg, a range of 3.204 kg (1.602 kg × 2). The uncertainty limits are greater than 56% of the central value. Put another way, the carbon dioxide emissions of this bar of chocolate may be 1.240 kg or, then again, more than two and a half times as much. How can we take such figures seriously? According to what mathematical reasoning can you calculate an amount to a precision of three decimal places and then calculate an uncertainty range that is greater than unity also to a precision of three decimal places? The precision of the result must be of the same order as the magnitude of the uncertainty. For example, the result of a sane calculation might produce 2.842 ± 0.007 – only lunatics find 2.842 ± 1.602 acceptable. We see this if we round out the preposterous decimals to produce the result 3 ± 2, giving a range between 1 and 5. This is more honest because it exposes the absurd vagueness of the result. When the uncertainty is greater than unity there is no point giving a result to a precision of three places of decimals: the precision is just not there. At the risk of labouring the point, suppose you had a digital room thermometer that stated that the temperature was a pleasant 20.842°C. Unfortunately, this thermometer is very inaccurate: a temperature reading is ± 10°C, meaning that the room might really be around a chilly 10°C or just as easily might be around a sweltering 30°C. A sane person would throw that thermometer away (= dispose of it responsibly, children) as unfit for purpose. An insane person would continue reporting temperature readings from it to three decimal places. How am I as a simple shopper supposed to respond to this information? It is not presented to me in the shop, only online, so they cannot really be expecting me to use this information as part of purchasing decision, which in turn shows that they are not at all serious about this number. I may lead a life that is so crushingly uneventful that buying a bar of chocolate counts as a high point, but I have not yet sunk so far that I spend my hours surfing product data for my purchases. Yummi, my favourite yogurt...but can I buy it with a clear conscience? Thanks to Migipedia and myclimate, customers can now look up the carbon footprint for any product at a glance. 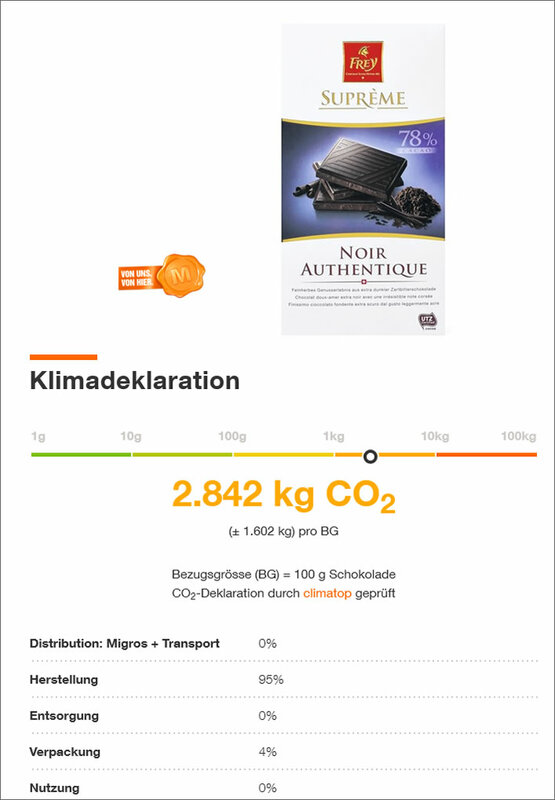 The Migros Cooperative Association had myclimate calculate the carbon footprints for many of the items in its product range. It was a truly Herculean task, but myclimate computed the carbon footprints for around 900 products in 22 product groups by the end of 2012. The results were published on the migipedia webpage. Carbon footprints cover the entire product lifecycle. By calculating and transparently declaring the carbon footprints for its products, MGB is making good on a promise of MGB's Generation M as part of its sustainability strategy. climatop, an independent organization, translates the data into easy-to-understand colour codes so customers can quickly and easily compare the carbon footprints of different products. 'Can I buy it with a clear conscience?' – Why not? It is Migros which gives this product a posh name, Suprême Noir Authentique, and which packs it attractively in aluminium foil and a printed cardboard outer, a packing which makes up 4% of the carbon dioxide emission per bar. The cheapo 'Budget' chocolate (see below) can do it with 1% of a lower total. If we follow this logic of blame, it is Migros that should have the bad conscience for even selling this planet killer. It is Migros which carries Suprême Noir Authentique in its range, charges a hefty price for it and displays it in the premium shelf space at adult eye level. Why should I feel guilty if I buy the product which Migros so seductively offers me? It is all completely futile virtue-signalling. Migros seems to have quietly abandoned the project anyway: the last and only comment on their 'Migipedia' page for 'Klimadeklaration' is nearly five years old (and the link to the page is wrong, too). Having given in to the green shakedown Migros lacks the courage to detach itself publicly from this insanity, which is why this lunacy, apparent in so many fields, will trickle on well past its use-by date. Their recently introduced products do not seem to be getting the 'climate declaration' anyway: most of the other chocolate bars in the range do not have one, so the purchasing help is truly incomplete and so just a pretence. However, a few do, meaning that, in order to save the planet, Migros is encouraging me to change over to M-Budget Milchschokolade (0.50 CHF), which only emits 1.305 kg carbon dioxide per bar, less than half that of the plutocrats' Suprême Noir Authentique (2.70 CHF). Remember, of course, that when we take into account the uncertainty range the bar of M-Budget Milchschokolade may even emit more carbon dioxide than Suprême Noir Authentique, we just don't know it. Save the planet? I should cocoa.